Tuesday evening was a very stormy one with regular showers rolling up the valley and obliterating the other side of my village from view. However it was my birthday and I was determined that we were going to get out for the picnic and walk that we had planned. I had a quick look at the latest weather radar pictures and decided that we had a window of a couple of hours to get down to Rhossili for some dry weather before the next bank of rain arrived. 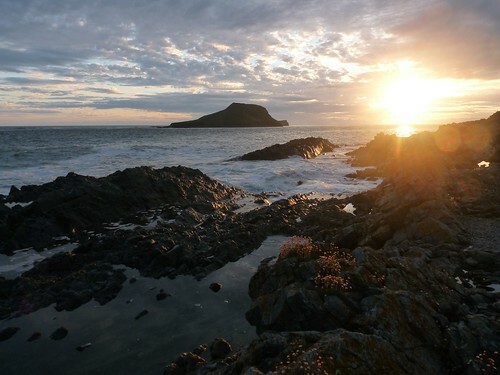 The journey there wasn't looking hopeful but things cleared up as the impressive shape of Worms Head came into view. We ate our food in the car (Tesco pasta pots for the win), before setting off on the walk to the cliffs. The tide was the highest I have ever seen it with almost none of the beach visible and the waves lapping at the edge of the old raised beach. Despite the relatively small swell the surfers were out in force. From the cliffs at the end of the path we walked down to the rocky foreshore to find the waves breaking fairly impressively. A Cormorant flew past out at sea while a couple of Linnets and a Blackbird were busy feeding in the gorse. Surprisingly there were relatively few gulls around with just a couple of Herring overhead. I hadn't come for the birds though as I was hoping that the weather would produce some decent lighting for a bit of landscape photography. I was pleasantly surprised to find that this was indeed the case as I spotted a vantage point from which I hadn't photographed before. I would always recommend looking behind you when you are photographing a view as often the vista can be just as impressive. 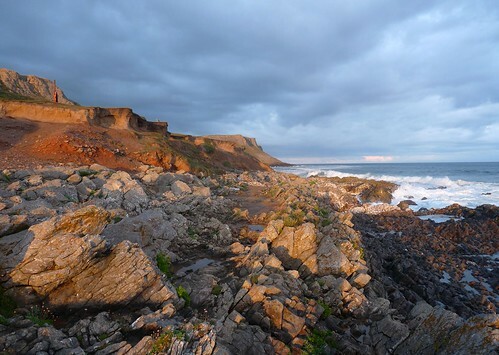 The low sun was catching the cliffs perfectly, highlighting the variety of colours that this area of coast offers. As we headed back up the cliffs a small flock of Swifts arrived and started to do some last minute feeding before darkness fell. Their speed and agility never fails to impress and they always manage to do at least a couple of very close fly-pasts. A very nice way to end the day. Do you know if kittiwakes still breed at Worms Head? Have they done so this year?